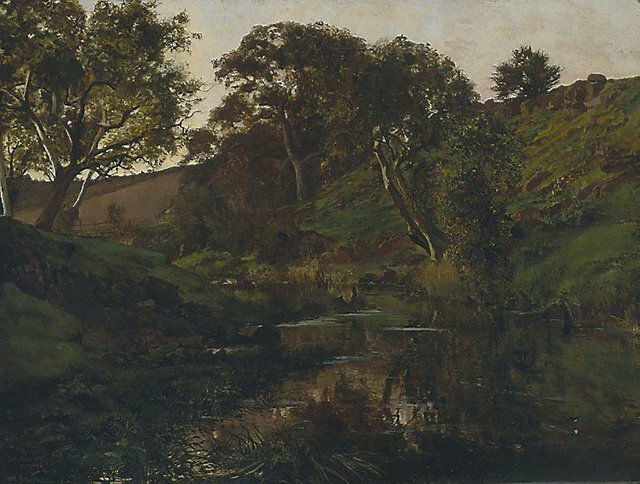 Julian Ashton's 'Evening, Merri Creek' 1882, was claimed by the artist as the first true 'plein air' oil painting in Australia, and therefore a key example for his encouragement of young artists to work directly in the open. "Mr Ashton has also on view a large landscape in oils, called 'Winter's Evening', a view on the Merri Creek. It is the time when the light is low, just before the sun sinks to its rest. The whole landscape is suffused with a glow from the setting luminary striking athwart the valley, lighting up the middle distance, which is very well rendered, and shimmering over the surface of the shallow water, above which some swallows are winging their arrowy flight. Gum trees line the sloping sides of the stream, the foreground being broken up with large boulders and reeds, the near foreground falling into shadow, which, like the crest of the ploughed field in the distance, is growing grey as sober evening with dewy fingers draws 'The gradual dusky veil'. The tone and colour of the landscape is very agreeable, the water admirable, and the whole work is in good keeping". The Merri Creek runs for approximately 70 kms, beginning near Wallan, a town on Melbourne's northern outskirts, and joining the Yarra River at Dight's fall, Collingwood. Signed and dated l.l., "J.R. ASHTON/ OCT 1882".